Although I already have a have a massive cookbook collection, I can't resist purchasing new Disney cookbooks when I visit the parks. Some are better than others, but I've found real winners in each Disney cookbook I have purchased over the years. During my recent trip I picked up a copy of The Best of Epcot Festivals Cookbook. It's only about $25 if you purchase it at Epcot (they currently have it for sale at Mouse Gear), but you can buy it for a premium through Amazon if you're not heading to the parks anytime soon. It contains recipes from both the Food and Wine Festival as well as the Flower and Garden Festival. I have a previous festival-themed cookbook, and about half a dozen or so of the recipes are repeats from the last book. There are several recipes in this newer edition that were new to the festival menus this past year, so they were never available before. There are also several recipes for dishes I tried and reviewed last May, so I'm really excited to make them myself now! With my Disney withdrawals at a record high, I decided to make one of the recipes from this book! 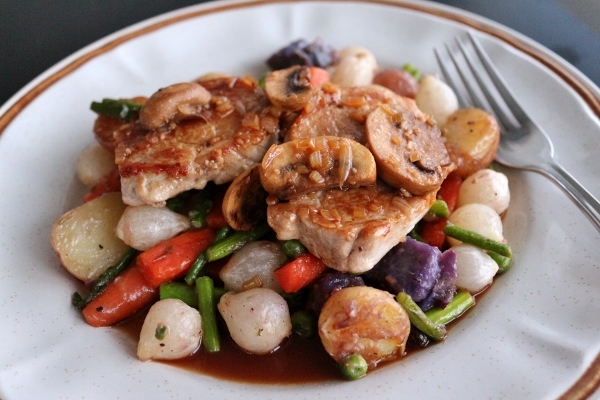 There are so many I'm dying to make, but the first one I picked is a Seared Pork Tenderloin with Mushroom Ragout served over a bed of sauteed spring vegetables and marble potatoes. So I know that it's winter and this recipe isn't super seasonal, however a couple of these ingredients are available frozen year round, and very decent quality at that (pearl onions and edamame or peas). Really the only vegetable that I consider to be particularly seasonal here is asparagus, and through the magic of my super market, I was still able to purchase good quality asparagus (albeit not from my local farm) and use it in this recipe. I've made slight adaptations to the cooking method, which I think is an improvement. 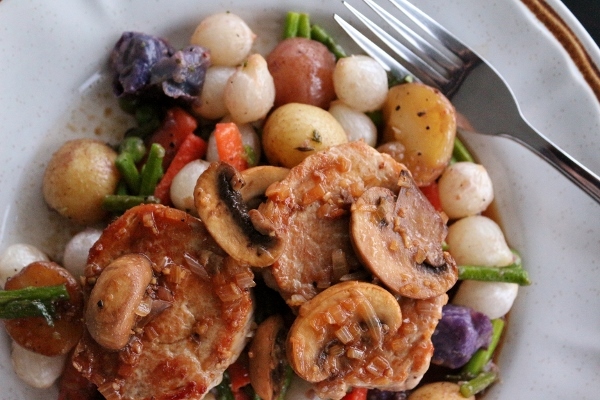 I used tiny red and gold creamer potatoes, and a couple slightly larger purple potatoes. I halved the creamers and chopped the purple potatoes into approximately 1-inch pieces to try to yield a similar size (they fell apart a bit when cooked because there's less skin holding them together--try finding marble potatoes in all three colors if you can). The original recipe doesn't have you add water and cover the potatoes and carrots, but I was concerned the potatoes wouldn't quite cook through with the way the recipe was original written (simply sauteing them in oil) so I used my intuition to make an adjustment, and it worked beautifully. I love the vibrant colors of the spring vegetable medley. The finished product is glazed in a bit of lemon-thyme butter, and serves as a bed for the seared pork tenderloin. I didn't have any heavy cream on hand so I omitted it from my ragout. Honestly, the sauce felt more like an intensely flavored jus as opposed to a ragout because it's not really thickened in any way (and in my case didn't contain the cream), and ragout suggests a thick and hearty sauce. 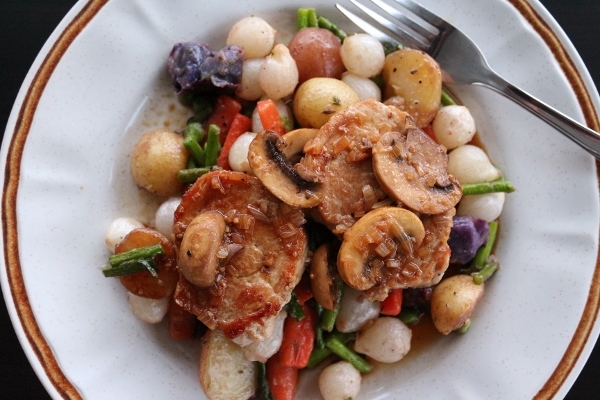 With that said, the ragout/jus is phenomenal, and a wonderful counterpart to the pork tenderloin and vegetables. This dish is truly a winner! 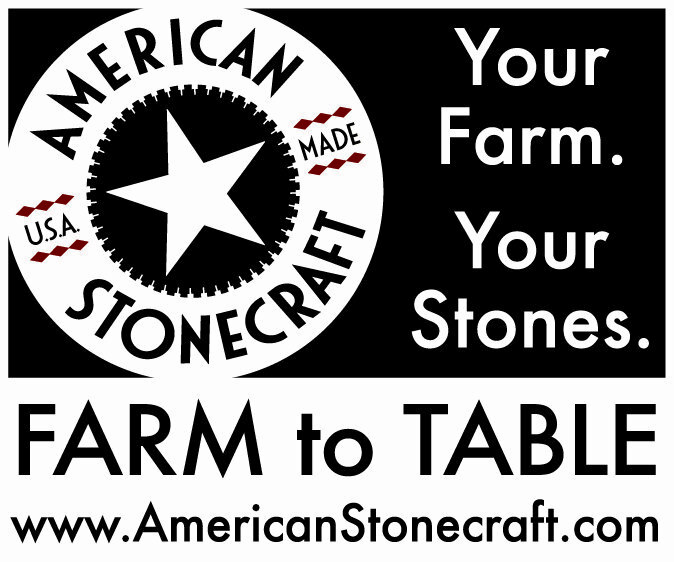 While it's not one of the selections we made at last year's Flower and Garden Festival, I'm very pleased to now have the recipe so I can make it myself. 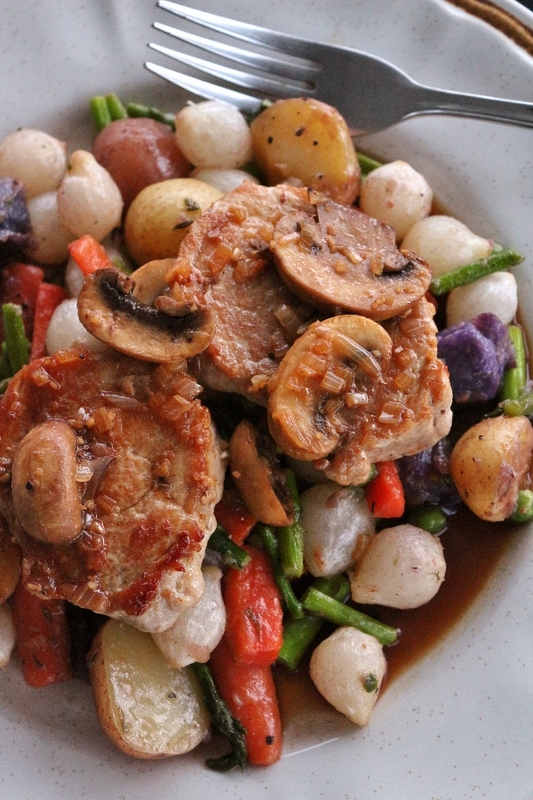 My entire family raved over this pork dish. We will definitely make it again! For the Lemon-Thyme Butter: Combine ingredients in a small bowl (be patient, fat and water don't mix easily so this may take a little work to get it cohesive). If not using immediately, refrigerate covered for up to 1 week. For the Pork Tenderloin and Spring Vegetables: Place the pork tenderloin pieces between two pieces of plastic wrap (or one piece of plastic wrap folded over); lightly pound with a rolling pin or meat mallet to flatten pieces to 1/2-inch thickness. Season with salt and pepper. Preheat the oven to 225 degrees F and set aside a small sheet pan. Heat 2 tablespoons oil in a large saute pan over medium heat. Add pork to pan (in batches if necessary) and sear both sides until cooked through and golden brown. Remove pork from pan and arrange on the small sheet pan. 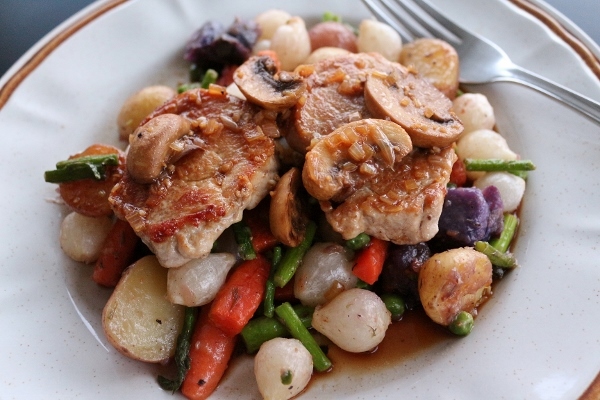 Place the sheet pan in the warm oven to keep pork warm while you cook the rest of the pork and the vegetables. While the pork is cooking, heat 2 tablespoons of oil in another large saute pan (non-stick would be preferable here) over medium heat. 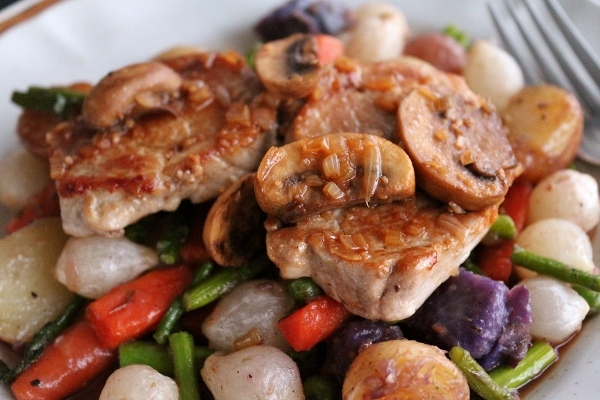 Add the marble potatoes and baby carrots, season with salt and pepper, and toss to combine. Add about 1/2 cup water and cover the pan with a lid. Continue to cook for about 10 minutes or more, stirring occasionally, until the potatoes are mostly tender (check with a fork). Remove the lid to allow any remaining water to evaporate. Add the pearl onions, season with a bit more salt and pepper, and saute 5 minutes. Add the asparagus and edamame (or peas), season again with salt and pepper (it's important to season after each addition), and saute for 5 minutes more. Remove pan from heat; add lemon-thyme butter and toss to coat. Taste and adjust seasoning with more salt and pepper if necessary. For the Mushroom Ragout: Place beef stock in a small saucepan over high heat. Boil until reduced by 2/3 leaving 1 cup. Set aside. In the same pan used to sear the pork medallions, heat oil over medium heat. Add mushrooms and saute until tender. Add shallots and garlic and continue to saute until fragrant, about 1 minute. Add Champagne vinegar and heavy cream, scraping the bottom of the pan to loosen any caramelized bits. Mix in reduced beef stock and bring to boil. Remove from heat and whisk in room temperature butter. Season with salt and pepper. To serve: Divide vegetables among 4 to 6 plates. 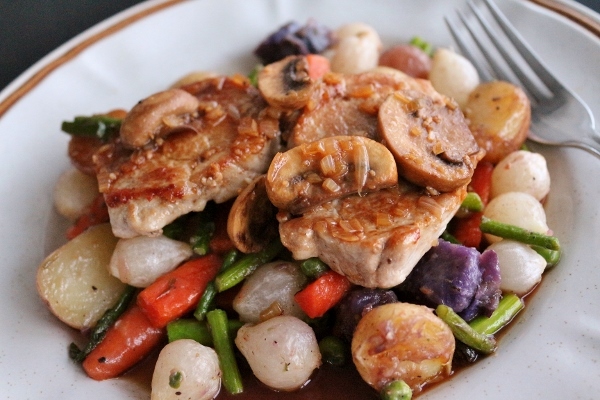 Evenly divide pork on top of vegetables and spoon mushroom ragout over pork. Wine Pairing Suggestion: Try a French Syrah or Australian Shiraz: full-bodied and dry, with black cherry and blueberry fruit aromas and flavors.